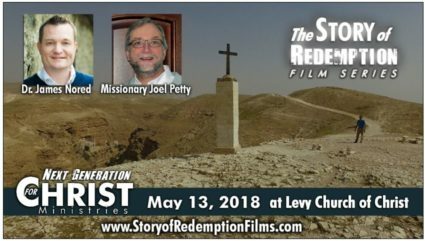 Our guest speaker on May 13, James Nored, will be sharing with us his video series and evangelistic outreach tool, the Story of Redemption. He is with Next Generation for Christ Ministries. – Powerful, biblical, visual storytelling; professionally filmed in Israel and the U.S. He will speak during the morning auditorium class and the evening worship. Everyone is encouraged to attend this special event. Afterward, he would like to invite all shepherds, deacons, staff and ministry leaders for an extended visit with him.